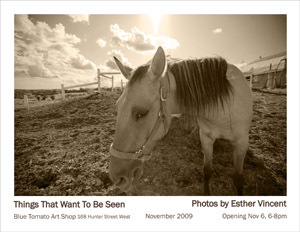 Peterborough, Ontario, Nov 1, 2009 — The Blue Tomato Artshop is hosting an exhibition of Esther Vincent's photography for the month of November. The exhibition, entitled "Things That Want To Be Seen," will feature photographs of local theatre and dance performance as well as animals and landscapes. The landscapes are part of a series of photographs to be used by local choreographer Bill James of Atlas Moves Watching for his Old Men Dancing piece, "Weathering," scheduled for performance in December at the Market Hall and in March 2010 at the Harbourfront World Stage in Toronto. "Photography has become a real adventure for me," says Vincent of her developing work. "It’s a constant learning process. Trying to capture a certain quality of light. Trying to reveal a key moment in a an actor or dancer’s performance. Or even trying to catch an animal with an open and curious expression. "When I’m out driving I get a huge thrill out of screeching the car to a halt on the side of the road to snap an image of a weather pattern or group of snoozing cows. "For me, it has become about seeing the mystery and wonder that is always present but easily missed. I like to take photos of things that want to be seen." The exhibition runs from November 1st to 30th. The opening is Friday, November 6th from 6 to 8 pm. The Blue Tomato is located at 168 Hunter Street West.